Given that all things Internet seem to move at the speed of light and come or go overnight, it’s fairly impressive to see commercial email marketing approaching its fifteenth birthday. 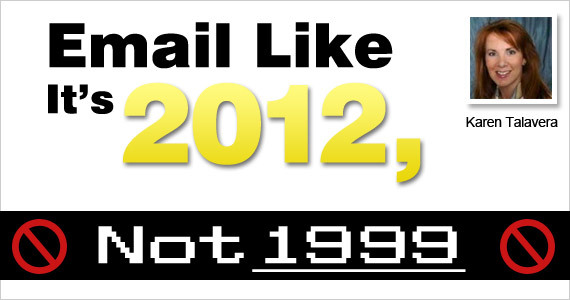 I remember first becoming involved in email in 1999 and being impressed then with what was creatively and technically possible – even though dial-up Internet connections still outnumbered broadband! Although anti-spam software and abuse-prevention delivery rules have often thwarted the channel’s technical capabilities (even since its early years – video in email was possible in 2000), there is no excuse to still be mailing like it’s 1999. After a decade of “best practices”, it’s high time to examine the core components of your email program to be sure you’re applying contemporary thinking and capabilities rather than simply re-running what worked or was assumed to have worked in the past. Many so-called “best practices” are far from evergreen and if not re-examined continually, become the number one reason an email program slowly degenerates into mediocrity and diminishing returns. 1999: Opt-in permission was a much-supported standard of early email marketing but never legally mandated in the US. The result? To develop email lists of any critical mass, marketers often disregarded permission, favoring quantity over quality and adding email addresses to their files through any means possible – co-reg deals, list swaps, and compiling data from directories or prospect files. Long story short, there are plenty of large email lists amassed through less than opt-in means, a huge percentage of which are disengaged, unresponsive people who probably shouldn’t have been there in the first place. 2012: First, examine your email address gathering methods for a) use of clear permission and b) a UVP (unique value proposition) that entices engagement from subscribers. Not that both aren’t important – they are – but valuing quality (of list members) over quantity always results in better qualified, more engaged list members which translates into better response performance and ROI. Keep in mind too that large percentages of inactive, disengaged subscribers can affect your deliverability and reputation, since some of those inactives will included abandoned accounts-turned-spamtraps; and hitting spamtraps frequently can land you on blacklists. With at least two major ISPs now also monitoring email address owner engagement with email messages and using it as a determiner or inbox placement, keeping broad swaths of “zombies” on your list will, over time, actually harm your ability to reach the people who really want your email as you find campaigns increasingly relegated to the junk folder. So, either re-engage your inactives with an orchestrated campaign, or suppress them, and remember to conduct regular email list hygiene to identify and remove spamtraps. 1999: The conventional wisdom on subject lines was “keep ‘em short and sweet”, “long subject lines will be truncated” and “don’t use the word free”. None of these practices are relevant today. 2012: While it’s true long subject lines may still not be fully visible in many email client viewers, their content itself is rarely if ever cut off or truncated. New research by Alchemy Worx, a London-based ESP, reveals long subject lines to be powerful motivators of not only opens, but also clicks, and as a result better relevancy indicators than short subject lines. Long subject lines also allow the inclusion of multiple vs. single topics – for email messages with multiple offers or benefits this makes for a more descriptive subject line which better sets and manages the expectation of recipients as to what the email is about, and therefore correlates to a higher incidence of actually responding to the email offer vs. just being intrigued enough to open the message. And yes, in the early days of email when content filtering was king, the word “free” did sometimes trip spam filters and result in junked campaigns. Free, however, remains one of the most powerful words in direct response, and rarely does it trigger content filters today. So if you have a great free piece of content, free trial, or free gift, be sure people know it! 1999: The basic metrics of email campaigns told the story as we measured delivered, opens, clicks, conversions and unsubscribes. Was there more revenue than cost at the end of the day? Great! Positive ROI! 2012: While basic email process metrics and ROI remain staples of campaign analysis, they don’t tell the whole story and we can’t stop there today. Contemporary smart email marketers look beyond open/click/conversion rate (how many people took this action on campaign “x”?) and are examining open/click/conversion reach (what percentage of people on my list has ever opened and what’s the frequency distribution?). In addition, contribution metrics like AOV (average order value) and RPE (revenue per email address) also paint a richer results picture than simple ROI and serve as meaningful metrics when comparing the results of one campaign to another or when comparing head-to-head test groups. 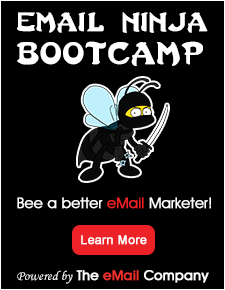 In 2012 successful email marketing isn’t simply about just being in the red or the black at the end of a campaign or business cycle. Today it’s about maximizing potential and continuous improvement – achieving optimal delivery, response, and financial contribution from the channel: the biggest “bang for our buck”, the max for the minimum, the most efficient use of resources, and the brightest, most relevant application of strategy. Takeaway: Times have changed and with them the rules of email have evolved and will continue to evolve. Success in this channel is (and I believe always will be) defined by flexibility, agility and innovation. Stay nimble, always question your assumptions, don’t be afraid to experiment and you’ll be light years ahead of the pack who’s still emailing like it’s 1999.